This recipe uses a kind of simple chicken dumpling known as gan. Add lotus root to the minced chicken to give a little accent to the texture of the dumplings. 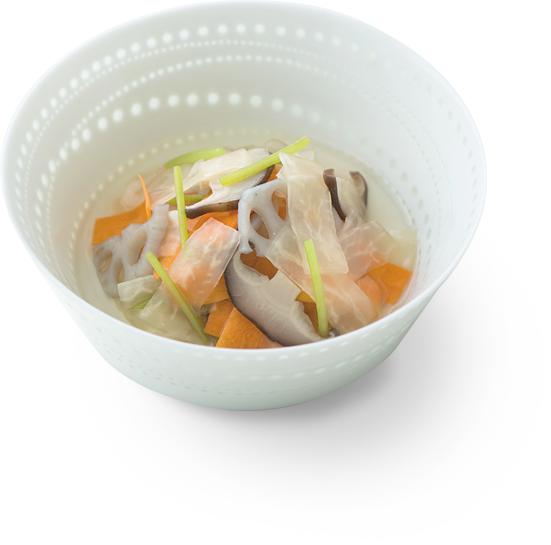 The flavor of the kombu dashi and the chicken blend together in the soup, bringing out the sweetness of the turnip. wash off the salt, soak the seaweed in water, then cut it into easy-to-eat pieces. ❶Peel the turnips and cut into thin slices using a slicer. * For the shimeji mushrooms, remove the hard tips and break apart. Peel the lotus root and chop roughly into small pieces. ❷Put the mince, the lotus root from step 1) and the ingredients from group A into a bowl, then knead well until the mixture is sticky. 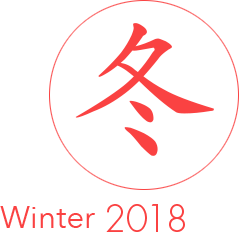 ❸Put the ingredients from group B into a pot, then place over a medium heat. 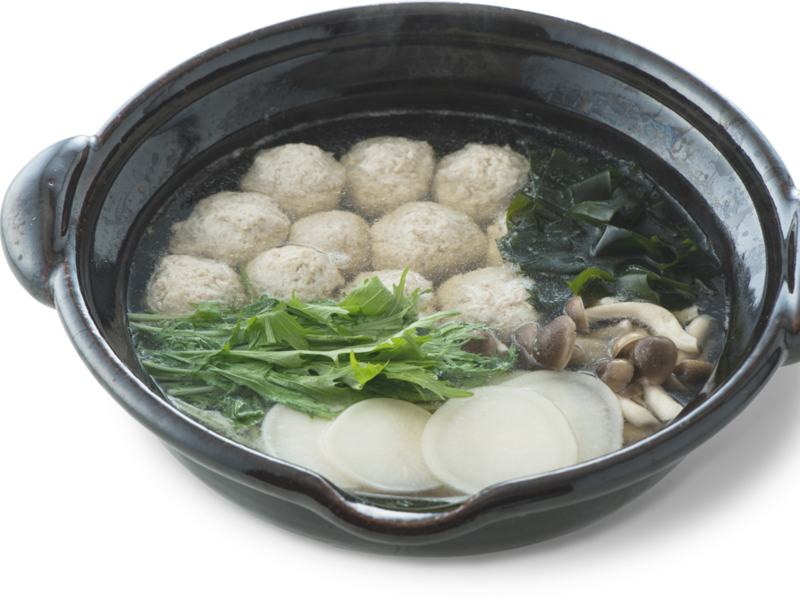 When the soup starts to boil, make ball-shaped dumplings using the mixture from step 2), then add them to the pot. ❹Simmer while scooping off the scum. Once the dumplings have been heated through, increase the heat slightly. After this, add the turnip slices and shimeji mushrooms, adjust the flavor with salt and light soy sauce, then simmer for 2–3 minutes. ❺Finally, add the seaweed and mizuna greens, bring to a brief boil, then turn off the heat. Add yuzu pepper and black shichimi spices if desired. * If you cut the turnip against its fibers, the slices will come out softer, while if you cut along the fibers, the slices will have more texture—prepare it as you prefer. This namasu (a salad of vegetables seasoned in vinegar) has a light, somewhat tart flavor and uses plenty of seasonal ingredients. We’ve used carrot, daikon, lotus root, fresh shiitake mushrooms, and mitsuba parsley to make the dish very colorful. This is rice mixed with suguki, a variety of pickle that is closely associated with Kyoto. 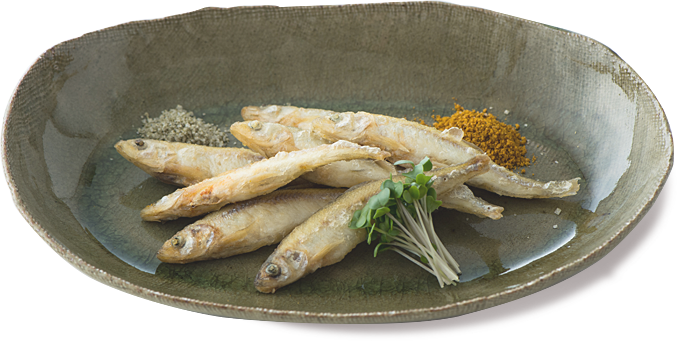 Pickled in salt, the suguki is allowed to ferment and mature in a special room called a muro*, and once it’s ready, it is shipped out to herald the arrival of the winter season. 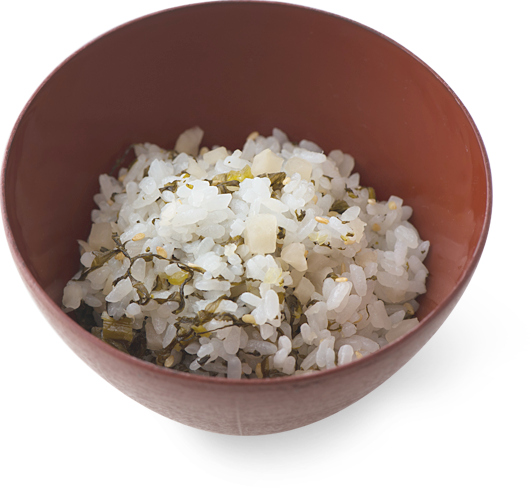 Suguki has a gentle blend of sour and umami flavors, making the rice taste even better. the fermentation process, bringing out the flavor unique to suguki. 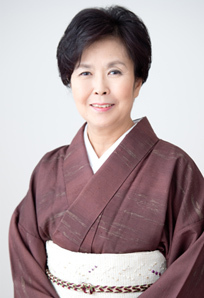 orn as the eldest daughter of the grand master of Mushanokoji-senke, one of the three main schools of Japanese tea ceremony. Goto studied ceramics as an art history major at Doshisha University. Her dishes, based on kaiseki-ryori which she received training from her mother, a leading pioneer of chakaiseki-ryori (a traditional meal served to guests before a tea ceremony), incorporates different ingredients and cooking styles she encountered from her frequent visits abroad. Her dishes, arranged for the contemporary household, embody the culinary culture and soul of Japan. Japan during the Edo period was a feudal society, where rice was used as the index for the economy. Approximately 80% of the population of Japan at the time is said to have lived in rural areas that carried out rice-growing. In the context of this rural life, people prayed for bumper crops and gave thanks for the harvest, and as such, numerous festivals and events took place throughout the year. One such event took place at New Year, to welcome Toshigami (the kami who was believed to administer good harvests) and offer him food at the household Shinto altar. In spring, Toshigami would come to the village from the mountains to become the kami of the rice paddies, and when the autumn harvest ended, he would return to the mountains to become the kami of the mountains once more. People believed that he watched over those who worked in agriculture. It is also said that while Toshigami was the kami of the rice paddies, he was seen as an ancestral spirit as well. 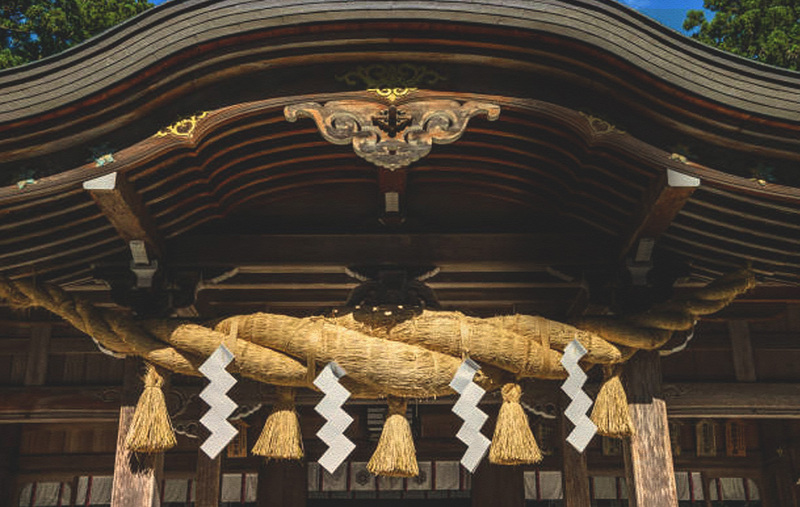 Many Japanese annual festivals and events resulted from rice-growing culture, but even in modern society, customs to welcome the New Year as a family still carry the broader point of gratitude to one’s ancestors and hopes and prayers for the future. Osechi ryōri is a celebratory selection of food which is offered to Toshigami and used to wish for good fortune in the coming year. The word formerly referred to food that was offered at seasonal festival days (the turning points of seasons), but eventually it came to refer to food for the New Year period specifically. 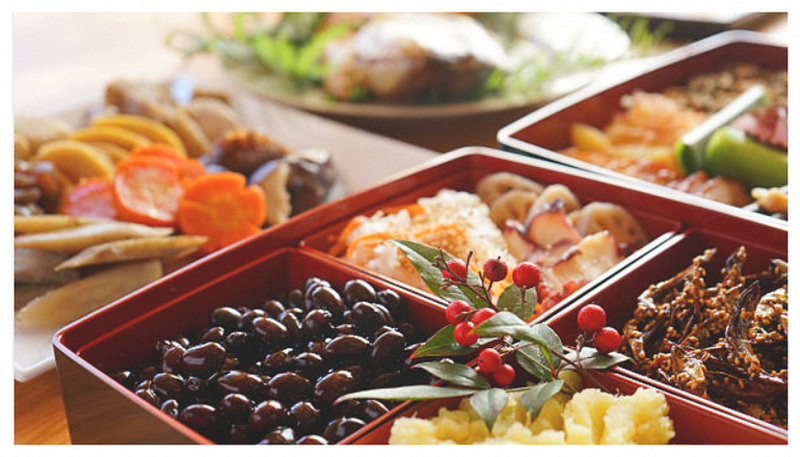 The idea behind osechi ryōri is to represent multilayered happiness, and as a result, the Japanese pack various colorful and auspicious foods into special tiered boxes called jūbako. 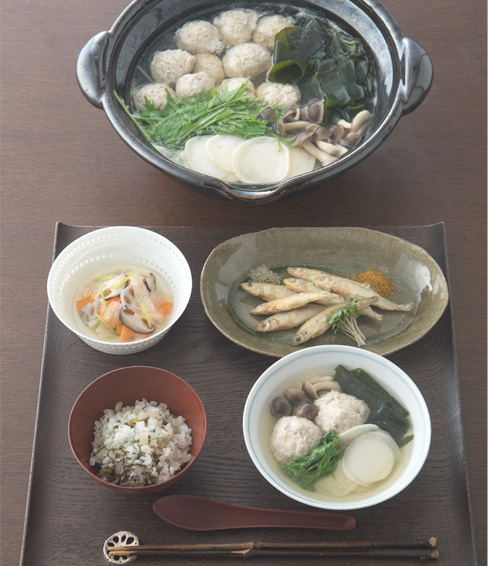 Of these, there are three major festive dishes that are essential to osechi ryōri. The regions of Japan have characteristic differences in which dishes are included: in the Kanto area of eastern Japan, the three dishes are kazunoko (herring roe), tazukuri (dried fish cooked in soy sauce), and kuro-mame (black soybeans), while Kyoto and other places in the Kansai area of western Japan use tataki-gobō (tenderized burdock with sesame dressing) instead of kuro-mame. These names, incidentally, include some double meanings: for example, tazukuri literally means “rice-paddy maker.” These traditional foods have significant meanings for local regions and society. By learning about one’s ancestors in this way, perhaps one can enjoy deeper communication with one’s family today. 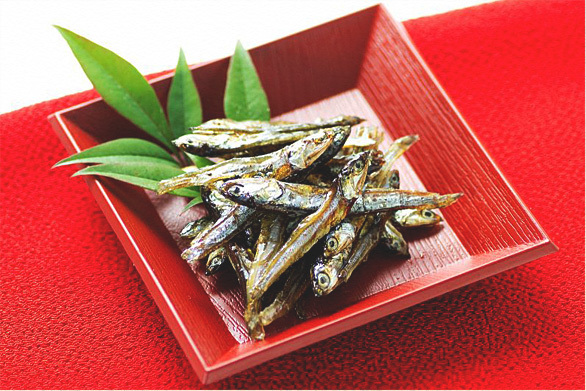 Tazukuri refers to dried fish (gomame, or small Japanese anchovies) cooked in a sweet soy sauce, and this is one of the dishes included in osechi ryōri to wish for abundance. As mentioned above, tazukuri means “rice-paddy maker”—this came from a custom in the past of using small fish as fertilizer for fields and paddies. Tazukuri is one of the three major festive dishes in both the Kanto and Kansai regions of Japan.